I'm writing this from a bench outside our rental apartment in Warsaw. Across from me sits an older couple and their anxious, unleashed pup. They're sharing some sort of starchy roll and the lady is carrying on, speaking heavily with her hands, while the man watches intently, nodding his head like he understands what she's saying. Maybe he does. Down the street there's a stir of commotion from the construction workers who are repairing the cathedral right next to the one that looks like something straight out of Hansel and Gretel. And beside me, a pigeon. Gobbling up the crumbly remnants of last night's feasts. This is where I am right now. I've tried writing this post a thousand times before. Ok, maybe not one thousand times but I have been trying to put this together for the past two weeks. Since we packed our bags and left Paris. No, since it happened. But something always comes up - editing photos, writing postcards, or, you know, the sheer fact that most of our time is devoted to seeing and touching and discovering new things. Our longer stays have come to a temporary halt and we're pushing through several short, quick trips that are packed with a mere 4 hours of shut eye, wandering off the beaten path, and trying to discover which European city does sushi best (ahem, Berlin is winning). And so, now that I've got a spot on a bench - a bench so suitable for writing I'm going to dream about it every time I sit down to draft a post - I'm going to take you back to that moment I've tried to reiterate so many times before. We sat on the pull out sofa of our rental apartment eating salad in our underwear. It was hot, and the clouds and rain and all of the noise that comes with that sort of meteorological situation had just moved into Paris. We shoveled forkfuls of leafy greens and other herbaceous plants into our mouths as we watched the rain pound down on the roof across the courtyard. It splattered hard for a good 20 minutes, but not as hard as we fought the night before. I can't even remember what it was about - which is an indication it was probably not worth getting nearly as emotionally involved as we did. But couples who have made it past the point where the teeth clenching arguments actually exist but no longer end in I'M LEAVING and instead are met with heavy sighs of GODDAMNIT I CAN'T STAND YOU RIGHT NOW BUT LET'S FIGURE THIS OUT will understand exactly where we were at that particular moment in time. But this isn't about the argument. The argument was simply a catalyst to the one moment from this trip I hold deepest in my heart. A moment so full of all of my favorite things I don't know how it didn't burst into tiny pieces and scatter across Paris that rainy afternoon. We sat in silence listening to the rain as it grew heavier and heavier. I thought about grabbing his hand and racing like hell down the spiral staircase to dance in the courtyard like the crazy-in-love people we tend to be, but he looked so comfortable eating his lunch that I couldn't bring myself to do it. And so I made a promise that I would if it was still raining when we finished. It wasn't, but with every clap of thunder I heard in the distance, I begged the gods to bring it a little bit closer; to precipitate the heaviest of raindrops because I needed it. My six years in the making, empire of love needed it. While I was waiting I eavesdropped on the couple across the courtyard as they bickered and put away dishes - probably from a meal they made together; maybe from a meal he made for her - and I got so lost in the clanking of bowls and eating utensils that I almost didn't notice the rain was slowly picking up. And 20 minutes later, after he had succumbed to the comfiness of the hide-a-bed and drifted into what his snoring would indicate was a deep slumber, I woke him with a fat kiss on the forehead, pulled him upright, and threw a pair of shorts in his lap. Without a word, I raced down the spiral staircase and he followed close behind. We danced and splashed in the cobblestone sidewalk puddles and embraced oneanother tightly. In that moment I didn't care that we said hurtful things the night before, because it wasn't the first time and it sure as hell wouldn't be the last. He grabbed my face and kissed me like he meant it. Like he was sorry. And we forgave one another, just like that. We laughed our way up the stairs, dried off, and collapsed on the couch. I laid there listening to the rhythm of his heart as it pounded through my temple and reverberated through every part of my body. It soothed The Girl Who Never Naps into a two hour dormancy and when I woke, the sun was shining and it was as if it had never even rained. We quickly threw ourselves together and walked up the street, hand in hand, to the nearest bakery. I sipped a glass of cold iced tea as he ate a peanut butter bar, and we talked about how sorry we were. How sometimes this love is so massive it can be suffocating, and we don't always deal with that in the best way possible. Do we, darling? But friends, this is undoubtedly one of the most beautiful parts about loving another human being. Sometimes it rains and your love gets drowned out by the torrential downpour of this thing we call life. But after the chaos - when the clouds have cleared and everything has settled - the beauty that remains is so pristine and raw you want to bottle it up and keep it forever. And you realize that despite your differences or mean words or inability to understand that some people are naturally forgetful even though they're able to retain every morsel of history surrounding the second World War, your love for one another is unparalleled. And at the end of the day, that's kind of all that matters. For Thom, with love. All of my love and then some. Notes: I had success replacing the unbleached flour with white spelt flour - but I'm afraid other whole grain flours may be too heavy (resulting in dense/chewier cinnamon rolls). 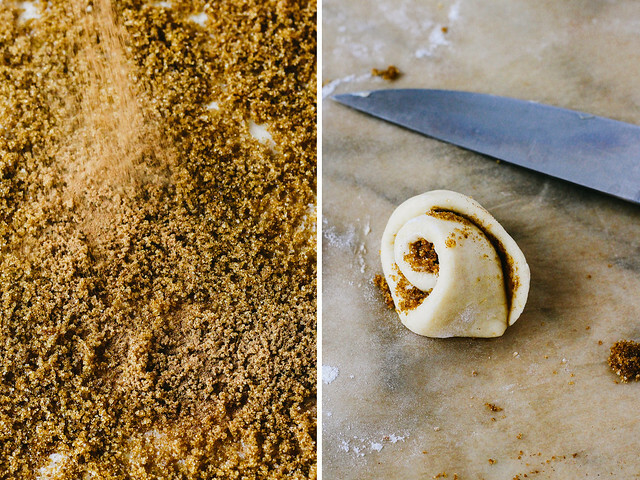 I've used sucanat, brown sugar, and muscovado sugar in this recipe and the muscovado sugar wins, hands down - but you can use whichever you'd like. The vegan butter in the dough can be replaced with any kind of oil, but you cannot use oil for the filling. 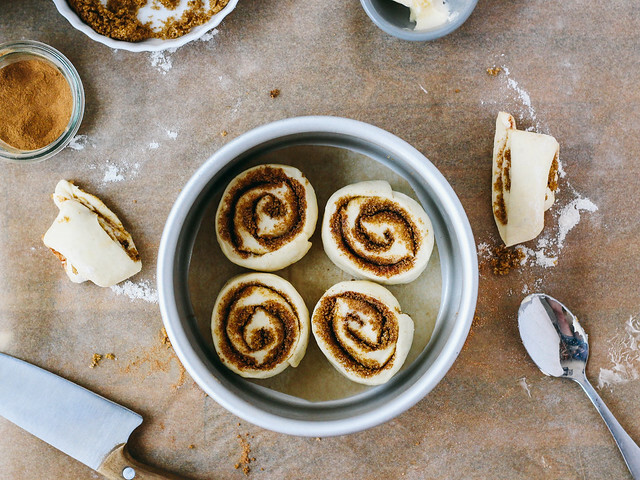 I trim the ends off my cinnamon rolls (and baked them in ramekins), but feel free to leave them on. 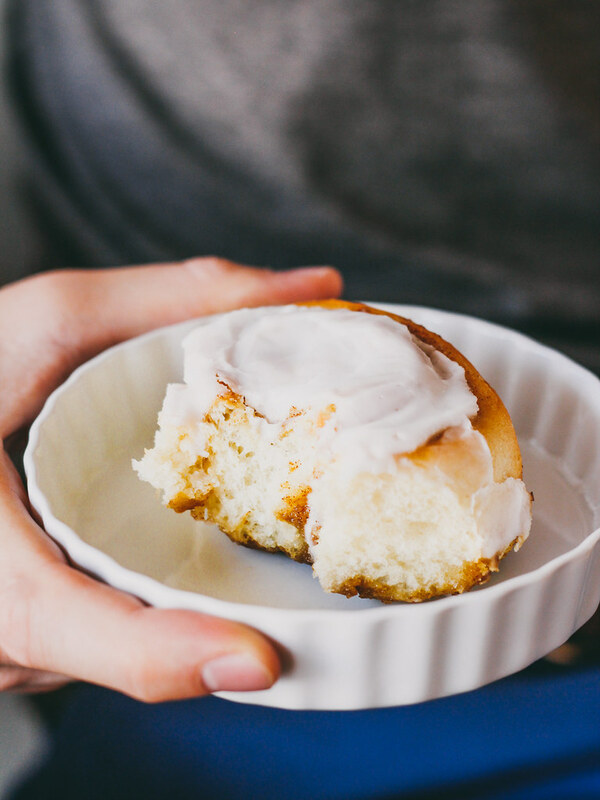 If you don't have a 6" round pan, bake the cinnamon rolls in a jumbo muffin pan or ramekins. Lightly oil a medium sized mixing bowl; set aside. Add the water to a small bowl and lightly stir in the yeast; add a pinch of sugar and set aside until foamy (10-15 minutes). If it doesn't look like this after 10-15 minutes, you need to start over. In another small mixing bowl, stir together the melted butter (make sure it's warm) and sugar - continue stirring until sugar is dissolved, about 1 minute. Mix in the milk and set aside. In a large mixing bowl, combine the flour and salt, then create a well in the center and add the yeast and butter mixtures. 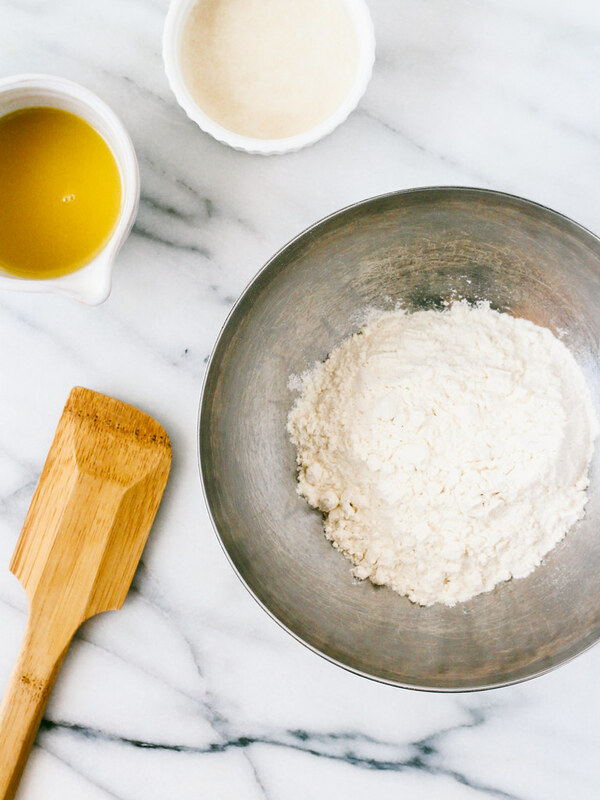 Stir with a wooden spoon to combine, then remove from bowl and knead with your hands for 4-5 minutes. 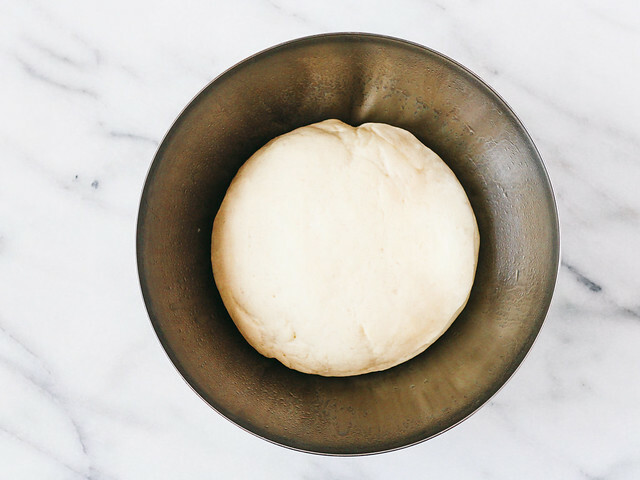 Once kneaded, transfer to the prepared mixing bowl, cover with plastic wrap, and store in a warm area of your house until doubled (about 45 minutes). Line a flat surface with parchment paper and sprinkle with flour. Once the dough has doubled, roll (or pat/press - I didn't have to use my rolling pin) dough into a 5X10" rectangle. Spread on the butter and top with muscovado sugar (really, as much as you desire) and cinnamon. 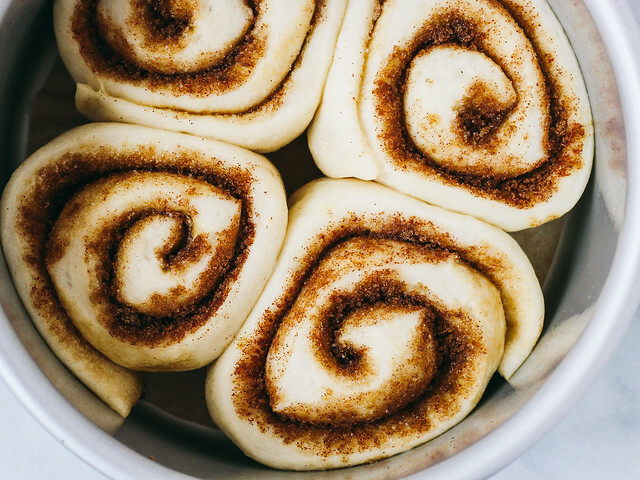 Starting at the short end, tightly roll the dough then cut into four even pieces. Put rolls in prepared baking pan and let rise for at least an additional 30 minutes (60 is optimal). Once they've doubled in size, bake at 375˚F for 12-14 minutes. Allow to cool in pan. 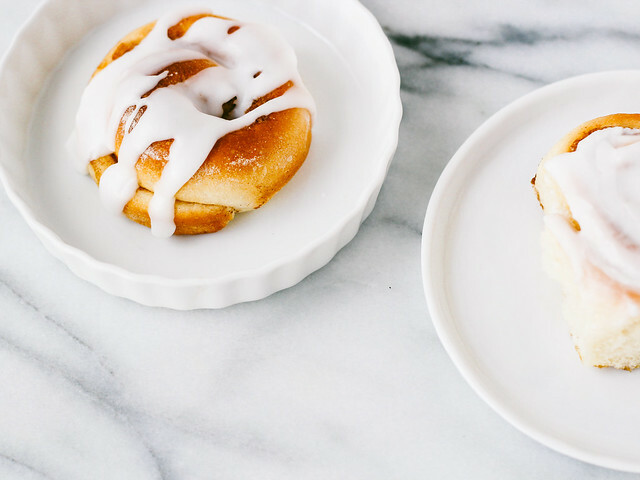 To prepare the icing, simply whisk together the sugar, milk, and vanilla extract. 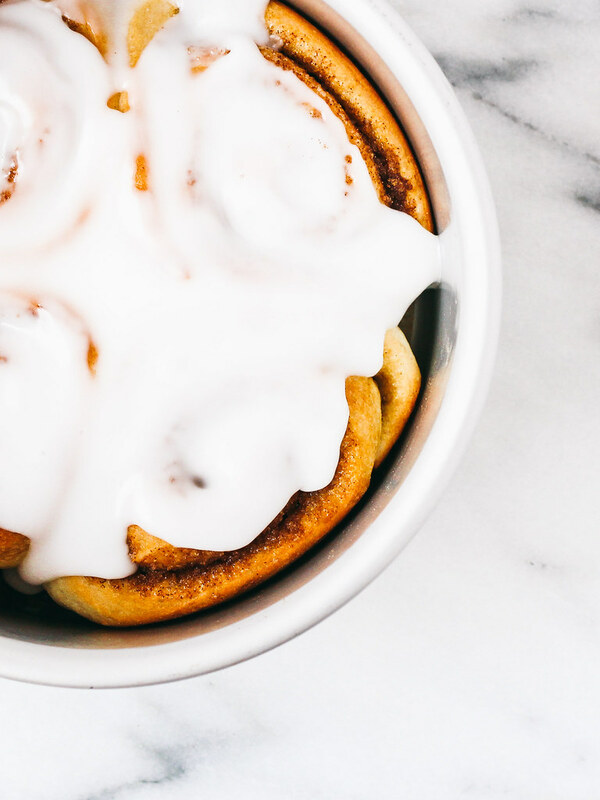 Once the cinnamon rolls have cooled for 10 minutes, top and serve immediately. 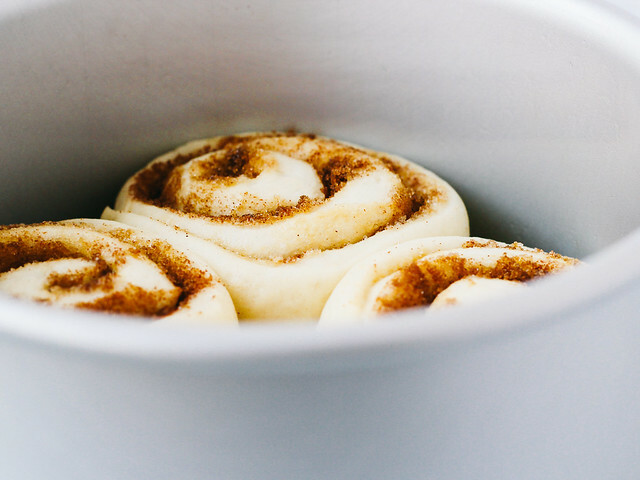 Rolls can be kept in an air tight container for up to three days.